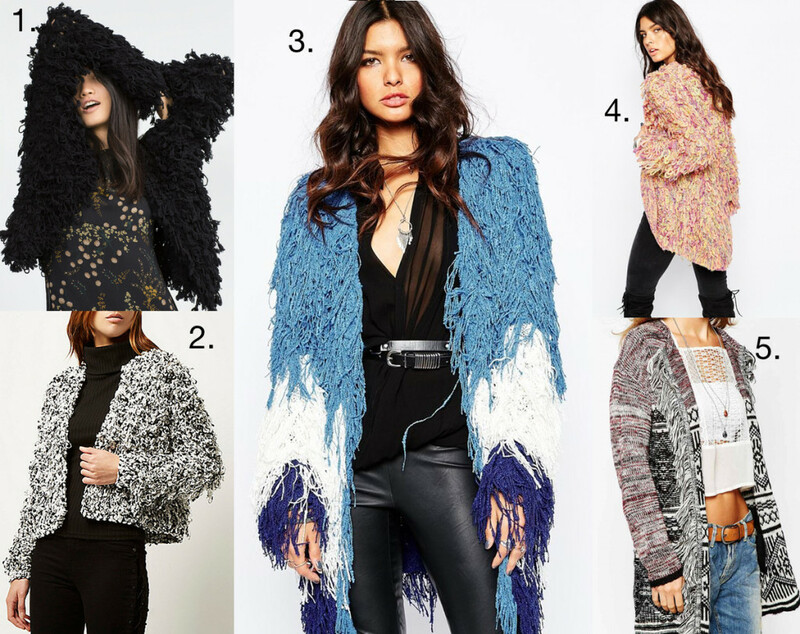 Here’s my round up of the best shaggy cardis on the high street. 1. This Short Jacket from Zara is like a hybrid of the two I currently have. It’s kind of messy looking with long, shaggy tassels and hits at the hips, making it the perfect length with shirts and jeans. Yours for £59.99. 2. River Island’s White Shaggy Crochet Cardi, £70, is the dream. I’d wear this one exactly like the model, pulling it over a black roll neck. It’s the most structured and dressy of the five. 3. If I could only buy one cardi from the list, this Lovers + Drifters Shaggy Fur Colour Block Jacket would be it. Firstly, I just love the way it looks slightly out of control with long, matted tassels. Secondly, I love the two blues against the white. The only thing I don’t love so much is the £115 price tag. Ouch. 4. With a name like Sunshine Soul Boho Shaggy Cardigan with Tassels you know you’re on to a good thing. The multicoloured mix of yellows, pinks and oranges is an instant mood lifter and I like the rounded cut as it nears the bottom. A bargain at £45. 5. The Esprit Fringe Kimono Cardigan, £59, is the most subtle of the five with minimal tassels running down the front. The relaxed fit and dropped shoulders make this the perfect weekend option for pulling over baggy jeans and slouchy tees. So, which one would you go for?